Fun card to make! I've already had a request to make another one just like it for a friend at work. I love this sketch! Definitely a keeper (but then I think all the FMS sketches are keepers!). Be sure to stop by Freshly Made Sketches and check out the wonderful creations from the Clean Team! And please come and play. I'd love to see your take on Rita's sketch! From the second you posted this on the DT page, I've been waiting to comment on it!! I just love this! Everything about it. 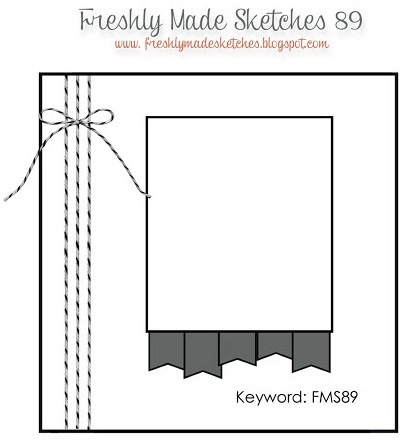 Your stamped image is fantastic and I love the banner prints! This is absolutely adorable! I love the rustic look - everything you used is perfect! I LOVE this card Linda! 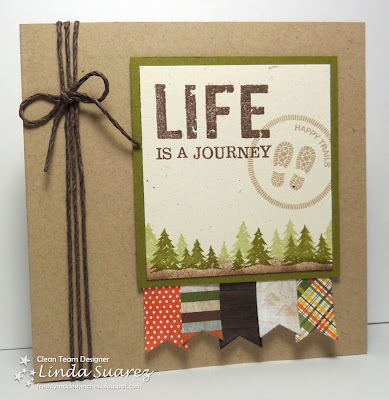 The rustic twine, the stamped line of trees, the fun patterned paper and that big, bold sentiment are fabulous! Linda, I fell in love with this as soon as I saw it. You really made my sketch look good this week. It is such an amazing card! Love all the stamping! Holy cow I love this!!!! This card is just amazing! I love those images and that paper!!! Just fabulous Linda!!! Wow Linda - this card is amazing! Love those gorgeous colours combined together and your sentiment is fabulous! I really love this card! The banners are fantastic!!! I just love this card, Linda! Those Simple Stories papers are perfect for your theme...love the colors and patterns on the banners! They just jump out at you against the serene woodland scene! Fabulous design, Linda! I love the images and how you used them. The colors and patterns are perfect, too!